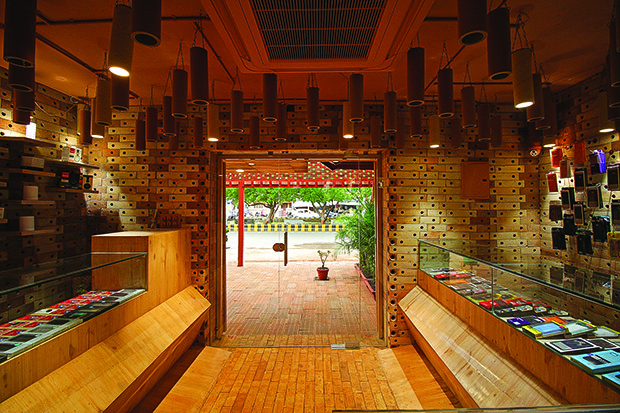 Dhaval Rangani-led I-Con Architects & Urban Planners use a dramatically different approach towards the design of a retail showroom for Dev Mobile in Rajkot, Gujarat, which results in a visual experience that celebrates connectivity, tradition and modernity. Retail spaces for gadgets and accessories aren’t known to be particularly innovative when it comes to their design. Their interiors rarely deviate from the standard clean-lined design with white surfaces, bright lighting and glass display units. However, Dev Mobile in Rajkot, Gujarat, is a wonderful exception, thanks to I-Con Architects & Urban Planners. This 152-square-metre store is located on one of the main streets of the city and spans two floors. The space was previously occupied by a commercial building that housed a vegetable market and seasonal vendors. 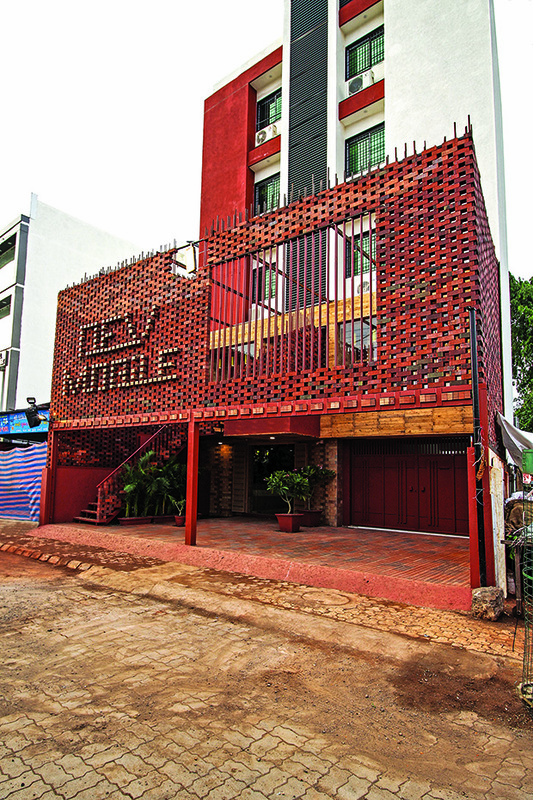 When the owners of Dev Mobile decided to open a retail outlet in its place, they approached Dhaval Rangani, the principal architect at I-Con Architects to execute the project. According to the team, the prerequisite for any retail space is that it must be designed in a way that it is not only easy to navigate, but also offers its customers a memorable experience. Dev Mobile was therefore conceptualized to accentuate its wares by depicting the importance of connectivity, while evoking an essence of the past. “Telecommunication has evolved greatly; telephones with dials pad have been replaced by mobile phones, for example. We wanted to highlight a similar link between the past and present in the architecture and interiors of the store. Therefore, traditional materials such as brick, wood and an earthy palette were envisioned in a contemporary style,” explains Dhaval. The concept of connection and intimacy was reflected through a soft transition in varying brick technology. 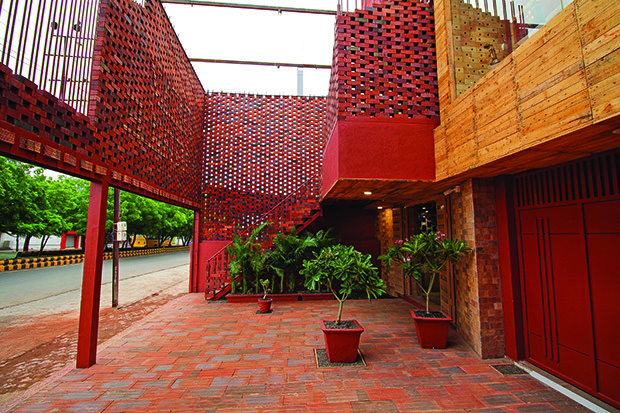 The brick jaali creates a semi porous skin between the retail space and the street. Also notice the steel bars that protrude beyond the facade. They depict the importance of an antenna, which catches the connection frequencies, in the field of communication. 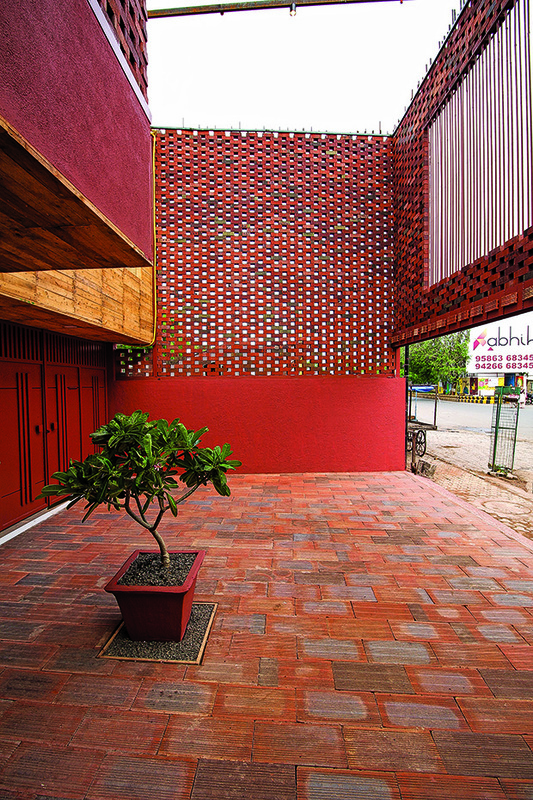 The brick jaali facade acts like a porous skin that prompts curiosity amongst passersby and beckons them to walk in and take a closer look. Numerous bricks have been individually woven into 19-mm thick steel rods to create the jaali. The bars are projected beyond to evoke the concept of an antenna that catches the connection frequencies. The entire ground floor is dedicated to mobile accessories, a pantry and the owner’s office. Here the flooring and walls have been covered in hollow yellow fire bricks. 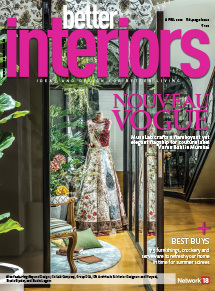 “A cutout in the jaali allows for visual connectivity with the display window on the first floor. 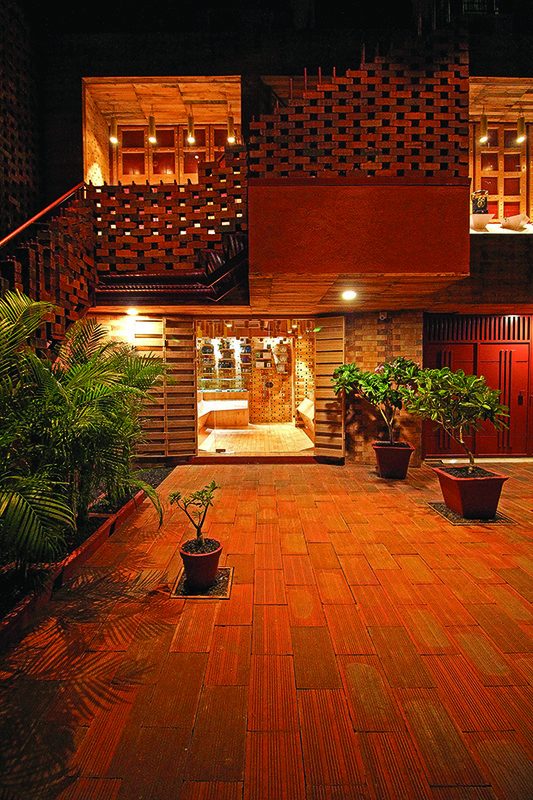 This is emphasized with waste wood bars around the edges against a backdrop of traditional window shutters,” says Dhaval. The pop-up display units arise from the base and hold antique models of telephones. The area in the foreground has an open-to-sky space lined with planters that are strategically placed to cover existing manholes. The foreground of the showroom is lined with plants. These planters have been placed strategically to treat the existing manholes aesthetically. 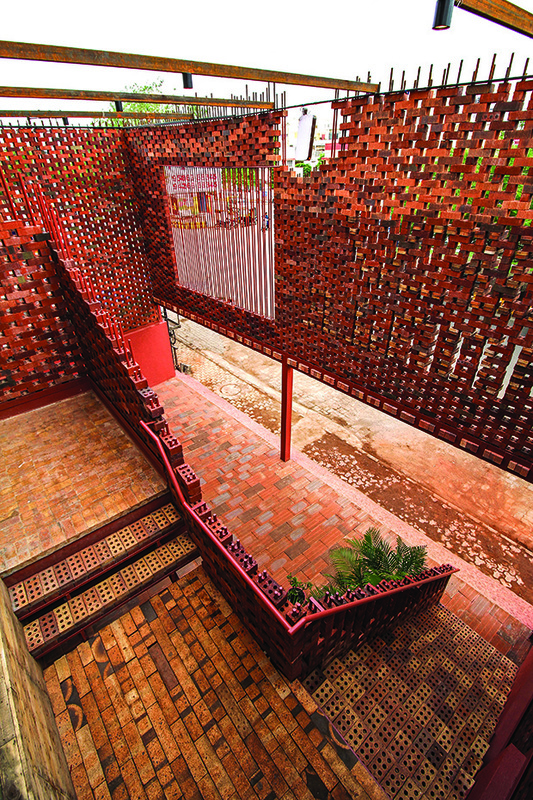 A staircase constructed out of a combination of yellow and red bricks takes one to the first floor. As one reaches the landing midway, the display squares take you through the journey of the evolution of telecommunication (read antique models of telephones). This creates an experience for the customer that traverses beyond the scope of retail. 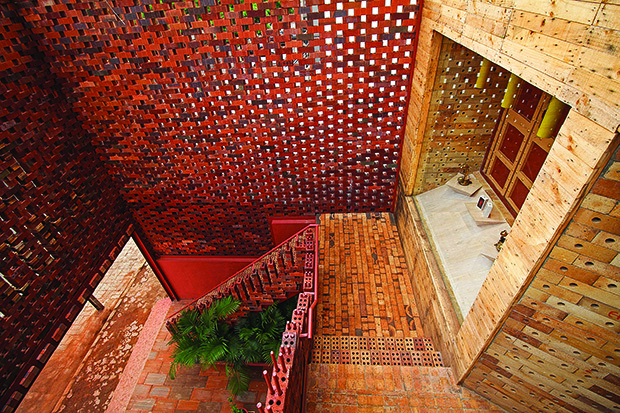 On the first floor too bricks have been used for the floor and walls while the furniture is carved from waste wood and glass to provide a sense of visual neutrality. 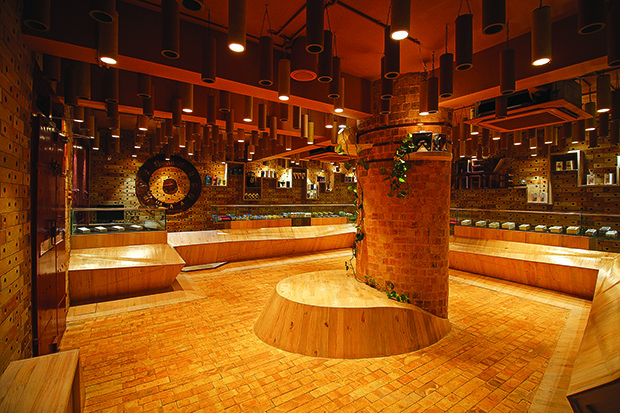 The shade of the wood seamlessly merges with that of the bricks, and the holes in the bricks create a pictorial disguise of extended connectivity throughout the volume of the space. The counters are lined in a C-shape along the periphery of the first floor for a wider angle view, with the central seating generating a two-way movement. This seat, supported by a huge pillar in the middle, rises from the floor with no rigid corners. The display shelves on the walls have been thoughtfully created to mimic a telecommunication frequency graph. Bespoke tube lighting, created from waste paper, has been hung from the ceilings on both floors to enhance the view of the display areas as well as add some drama. 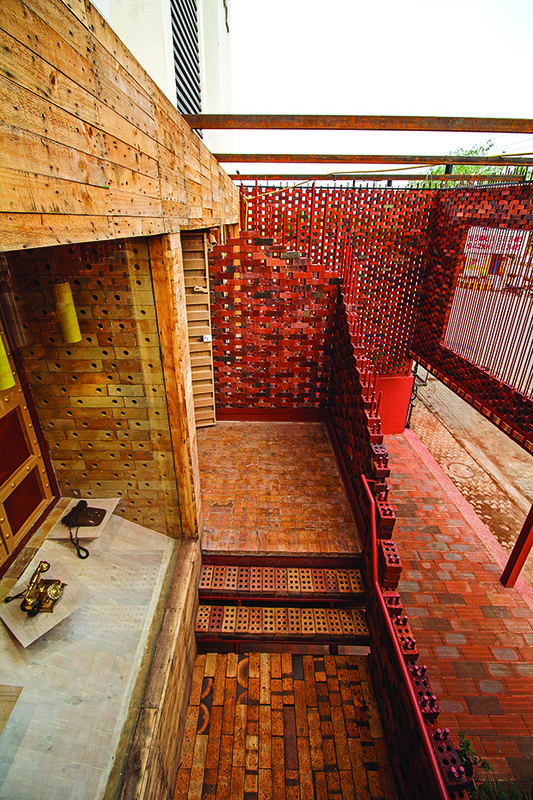 While a tight budget and a strict deadline were some initial challenges the architects faced, the entire design process came with its own set of trials, from the execution of the facade wall on hot summer days, collecting industrial waste wood for the furniture to sourcing old salvaged traditional doors and windows and laying bricks on the floor with wires and electric attachments passing through it. 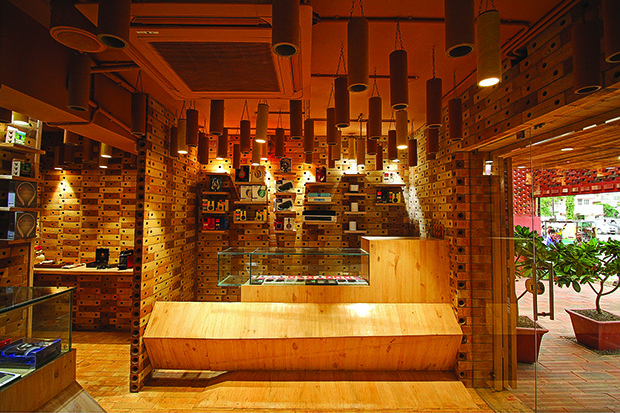 Dhaval and his team overcame all these difficulties to design a retail space that encapsulates the true essence of connectivity. The jaali and the open-to-sky-court lets natural light seep into the interiors while the plants enhance the link to nature and earthiness the architects were rooting for. A view of the staircase that leads to the first floor. The holes in the yellow brick wall and the red brick jaali reinforce the idea of uninterrupted communication similar to that of playful paper cup phones. The display squares on the landing midway to the first floor showcases antique phones and takes one through a journey of evolution in the field of telecommunication. The old-fashioned window lets daylight seep into the interiors, highlighting the vintage telephone on the counter. 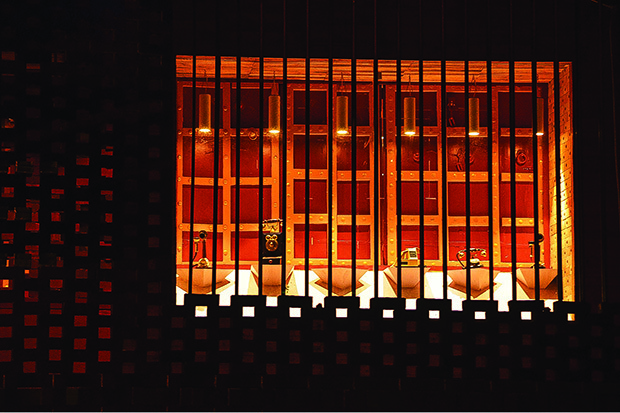 The half-open window gives a glimpse of the outer jaali which looks like an outline of a mobile phone. 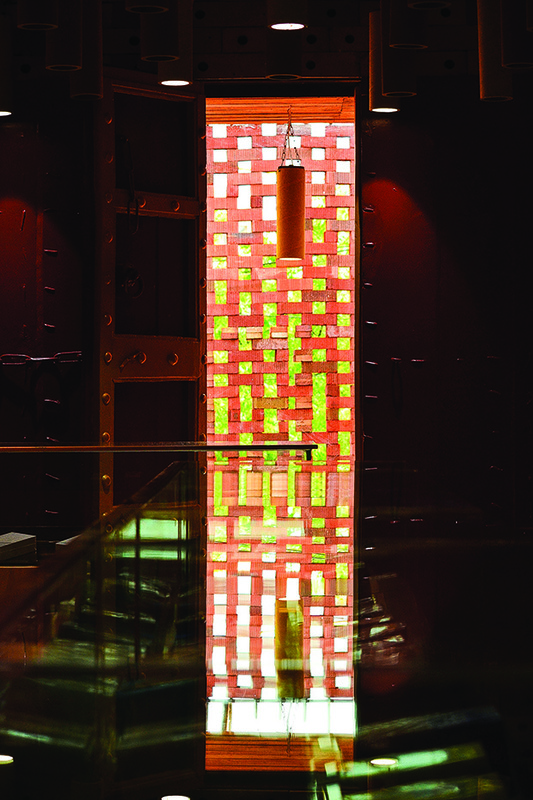 At nightfall, the red and yellow hues of the showroom are bathed in the warm glow of the bespoke lights. 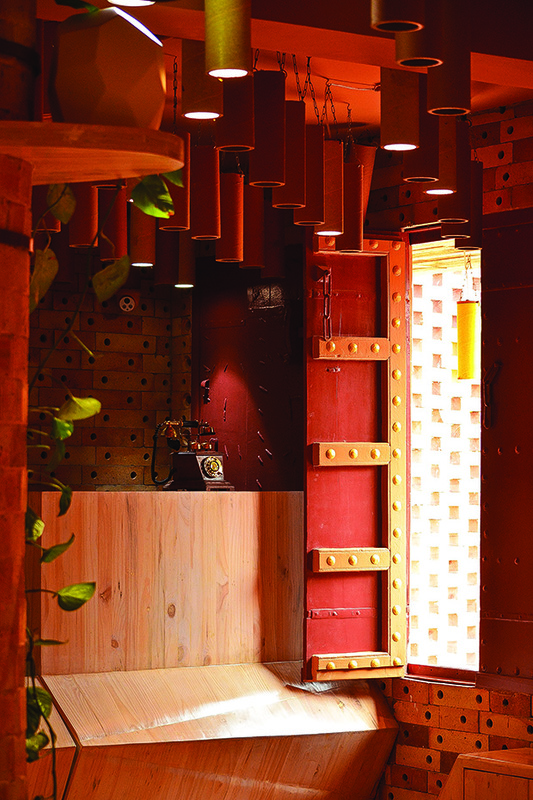 The cut-out in the jaali acts as a frame to the display window on the first floor landing. The display shelves are designed as a pop-up element from the base with paper tube lights illuminating each element individually. The mobile accessories section on the ground floor, with the doors opening out onto the street. A combination of waste wood and glass have been used to create the display units. One can also see the shelves on the wall that display the mobile phone accessories. The first floor is dedicated to the retail of mobile phones with the display counters created towards the periphery of the space. A central seating area not only merges with the design of the space but also allows for uninterrupted movement.